"Thank you so much for your kindness, it is so uplifting to me and helps me to get through this difficult time." "Thank you for your time and helpful attention to my questions. Your expertise and kindness are much appreciated." "Thank you and your staff for the guidance of my mother’s finances. I would have been totally lost without you." "Just a note to say thanks again for your kindness to me." "You are the most honest person that I have dealt with in the business world. I know that it is because of your Christian life and what it represents. I appreciate you helping us through the legal process." "Thank you so much for your time and advice. It was greatly appreciated." "It has been a pleasure working with you during the process of Medicaid for my mother. At this time she is doing well and seems happy. I have a feeling of relief and for that I thank you." "A note to thank you for your legal advice and for making out my Will — having a new and up-to-date Will is reassuring for me (doing the Will was a “reality check”- it made me realize I’m not immortal!!!)" "Thank you so much for your help over the past eighteen months. I feel blessed to have met you." "Thank you for taking the time to talk with my husband and I about my grandfather. Your help was greatly appreciated." "I know that you all worked really hard on my mother’s Medicaid. I can’t say enough words that could possibly express my gratitude! Thank you so much for your hard work. This means so much to me and my family. Mom is so happy in the nursing home. She has so many friends there and the staff just loves her. You all have made such an impact on our family in such a great way. Thank you from the bottom of our hearts.﻿﻿"
"You are a very dynamic speaker. Thank You!" "Thank you so much for speaking"..."We appreciate your commitment to informing and educating us on complicated subjects." 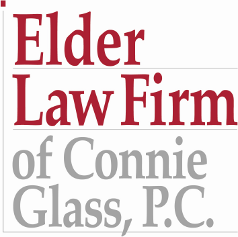 "Thanks to Connie Glass for her fine presentation. She covered topics that our members are keen to understand. Her handouts were clear, informative and easy to read. She was gentle and gracious to our members." "Thank you so much for your presentation"... "People seemed astounded by what they didn't know! It was a wonderful community program." "A note of thanks for all of the wonderful information you provided us last night at the Alzheimer’s Support Group. After hearing others speak highly of you throughout the years, I can see why. We are very fortunate that you are in our area." "Thank you so much for speaking to our Alzheimer’s Support Group last Tuesday. We all learned so much from you. I always learn new information."